This page 'on loan' from the Star (for the duration of the Dam Alert)! "THE most pristine and beautiful place I've ever been to." 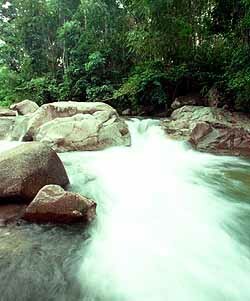 Few who have been there would disagree with Junil J's description of the areas around the often crystal-clear Sg Selangor and its tributaries, Chilling and Pertak rivers, near Kuala Kubu Baru, Selangor. It's an area of immense natural beauty. A place where the public and adventurous youths like Junil from Kuala Lumpur spend weekends. "Me and my buddies have been going there for the last 10 years," says Junil. It's not surprising. Everything seems perfect -- from the lovely misty route that snakes through rainforests to the scenic rocky rivers that have played host to thousands over the years, from the 30m roaring waterfall that always draws gasps, to the quaint town affectionately known as KKB that's a favourite stopover, and the orang asli who have co-existed with nature for generations. And it's only an hour away from Kuala Lumpur. Unfortunately, this paradise might not last long. There's a proposal to flood 600ha of this area with a large dam -- to be called the Selangor Dam -- ostensibly to counter the state's water shortage. If it goes ahead, it will be a major blow to recreation and tourism. The area is a favourite and essential recreation area, providing a green and pristine environment for residents of KKB and the Klang Valley. Many say it's also the best area in the country for not just white-water rafting but kayaking too, a rare honour. "The river is comparable to the world-famous Tully River in Cairns, Australia, that draws tourists the world over and provides lots of foreign exchange for the local economy," says Ishak Mohamad, director of a rafting operator, Khersonese Expeditions. Three eco-tour operators have set up centres along the river. The other two are Nomad Adventures and Tracks Outdoors. Nomad specialises in white-water kayaking while Tracks does kayaking, rafting, as well as mountain biking and trekking. They cater to locals (especially from Klang Valley), foreign tourists and expats. The operators provide substantial employment and income for the local communities. They buy supplies and provisions from KKB, and hire many of the orang asli as guides. According to Rubin Gan of Tracks, the EIA consultant for the project estimates that rafting alone is worth RM1.3 million a year. The majority of orang asli in the area are upset that they have been told to either move or get nothing. They were given the Nak maju ke tak!? line, says Ramsit Anggong, 39, batin of Kg Gerachi, who works part-time for Tracks and also has a mature fruit orchard that earns him RM10,000 annually. "Once this area is gone, there would be nothing left. No rafting, no orchards, no bamboos that most of us collect," he says softly. 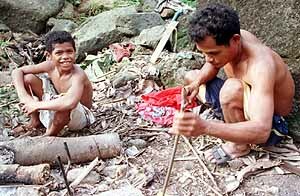 His brother Ajis says that once the tourists stop coming, he has no income. "Now, I bring them biking, trekking and rafting." Indeed, tourist arrivals (local and foreign) has been seeing a steady climb since the operators arrived in 1997. Gan estimates that 4,000 come a year, mostly on weekends. "It's only been two years. If we promote it better, there's no saying how popular this place could be. We've been told to encourage eco-tourism, and this place is ideal for a multitude of such activities." Canadian rafter/kayaker Andrew Fleming says he heard about the river when he was in Canada. "It's one of the best rivers I've ever done a run in!" An international race was held on the river last year and the national champ of France too said it was the best river he had ever been down, Gan adds. Upper Sungai Selangor is pristine -- at least for the moment. Gan and partner Carl Traeholt have invested about RM600,000 so far, but have no qualms about taking their business elsewhere. "I hope the project doesn't take-off, but if they don't want us in Selangor, we could always relocate to Sumatra or Nepal for rafting business," adds Gan, understandably frustrated with the lack of clear policies on eco-tourism. "But it's a shame, because we don't really lose, but nature and recreation do." He adds that if Malaysia bids for the Olympics, rafting is nowadays almost always included as an optional event and Sg. Selangor would be the perfect venue. The government's apparent promotion of watersports lately seems ironic. Do Malaysians have to go overseas for world-class sport rivers when we have one in our backyard? The orang asli, as usual, get kicked around and patronised. Ramsit says there needs to be discussion on level field with mutual respect. "They claim they will give each family RM250,000," he says in disbelief -- they have been made empty promises before by the Orang Asli Affairs Department (JHEOA). "But then they say they will keep our bank books because we don't know how to spend our money!" They are suspicious of the motives for building the dam. Ajis says he hears that logging might begin again. Attempts were made before to log the area, but stopped after locals protested. However, if the dam goes ahead, it is likely that the area would be logged again, a la Bakun. This means that if the dam is being built in a few months, the logging would begin much earlier, effectively destroying the unspoiled river through siltation, erosion and landslides. "The river would be dead. And it would be impossible to raft on," says Gan. Already, previous logging activities cause the clear water to turn brown when it rains. And when the wall is built, Gan doubts the developer would release enough water for the river to be of any use. "They may say something else now, but I'm sure they'd rather keep the water to fill the dam, unless they're willing to sign a contract!" 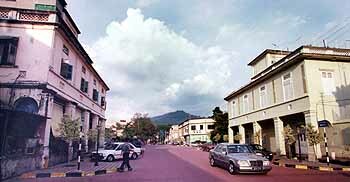 Residents and businesses in the quaint town of KKB are understandably worried about the Selangor Dam proposal. The road to Fraser's Hill that passes the town would be underwater, and another route through Kerling has been proposed, bypassing the town. Many fear KKB will turn into ghost town. Restaurant owner A. Subramaniam says they get a lot of clientele from those on the way to Fraser's or the picnic/rafting areas. "Everybody has a fear that the dam could break, as it has happened to us before (in 1883). Nothing can be predicted," he says. If built, the dam wall, at a height of 115m, will be 4km from the town. Resident Lee Chee Ming agrees, and is very upset that the town's favourite recreation area is being sacrificed. He says the picnicking areas are a favourite at weekends, when it gets people from KKB and KL coming to unwind or swim. "All our kids have grown up with Pertak (a picnic spot)." The Temuan of Kg. Gerachi have been told to move so that the dam project can be carried out. Adds Dr A.S. Nathan, a dentist in town, "I actually am from SS 5 (PJ), where the water problem last year was real bad. But I don't think this dam is the way to go about solving the water problem." As the flow of water is reduced by the dam, there are fears that other economic activities all along the river would be affected. Kuala Selangor, with it's healthy tourism industry thanks to its fireflies, could suffer. Dr Loh Chi Leong, senior scientific officer at the Malaysian Nature Society (MNS), fears if the original consultant's plan is used, sea water would move further upstream and kill the trees that now attract these insects by the thousands. Other industries include aquaculture, mainly the thriving cockle farms along the river. Critics of the dam proposal say there are better options that have to be considered. They also are frustrated with the lack of information that's forthcoming. Dr Loh says MNS would like to see alternative sites being explored. "Preferably where the damage is not as much and impacts fewer people. The river should have a total river management plan, so there's less chance of one acitivity or project adversely affecting others. Water is important, but not to the exclusion of everything else." Worldwide Fund for Nature (WWF) environment policy analyst Andrew Ng says dams are not necessarily a solution to water problems. "You can't deal with this issue in isolation because dams normally have a large impact downstream." WWF is now awaiting the release of the Environment Impact Assessment (EIA) report, which should be made public anytime now for the one-month objection period. The project was proposed to the Selangor government by a TSWA-Gamuda-KDEB Consortium. Alternative solutions to the water problem include using the proposed RM1.4 billion for the dam (excluding compensation, cost of diversion road, loss of flora and fauna, loss of income from tourism, etc, potential damage to the river and dependent businesses downstream) to repaire old pipes (as leakages cause losses of between 30 to 40 percent of treated water); using more of our vast groundwater resources; changing attitudes so we value water; and adjusting the price of water to reflect its "scarcity." Basically, says KKB resident Mary Maguire, the dam proposal highlights the mess water management in Malaysia is currently in. "With the kind of rainfall we get, how is there a water shortage?" She adds that the dam is a temporary solution, while the loss of Sg. Selangor -- and everything else associated with it -- is permanent.